Democratic elected officials and activists gathered Tuesday in support of the San Gabriel Mountains National Monument, expressing concern that the 346,000-acre expanse of land northeast of Los Angeles could be threatened under a pending review ordered by President Donald Trump. 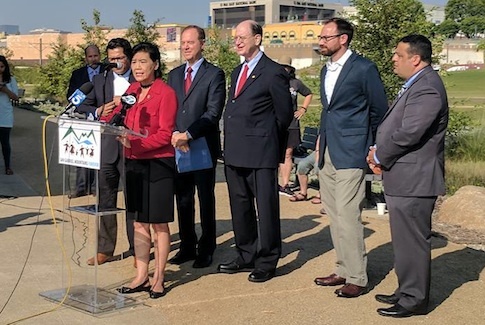 and fresh air for the people of Los Angeles County,” Rep. Judy Chu, D-Pasadena, said at a news conference at Los Angeles Historic Park. The monument is one of more than four dozen placed under scrutiny by Trump, who issued an executive order in April calling for a review of monuments designated under the Antiquities Act of 1906, which grants the president authority to declare federal lands of historic or scientific value as national monuments. The San Gabriel Mountains monument was created by President Barack Obama by executive order in 2014. Some Republican lawmakers criticized the move at the time, saying it would restrict access to public land and have a negative impact on water resources, flood control facilities and roads. Chu was a major proponent of the monument designation. She had originally pushed to have 600,000 acres of the mountain range declared a national monument. Rep. Adam Schiff, D-Burbank, also spoke in favor of maintaining the monument in its current form, and criticized Trump’s order mandating the review. U.S. Secretary of the Interior Ryan Zinke is expected to announce the results of his review and any recommendations this week, no later than Thursday. Zinke has already concluded his review of several other monuments, recommending no changes. Among those was the Sand to Snow National Monument, a 154,000-acre expanse in the San Gorgonio wilderness area of the San Bernardino National Forest, stretching into both Riverside and San Bernardino counties.